Tagline- Leave the Children At Home and If You Are Squeamish Stay Home with Them! 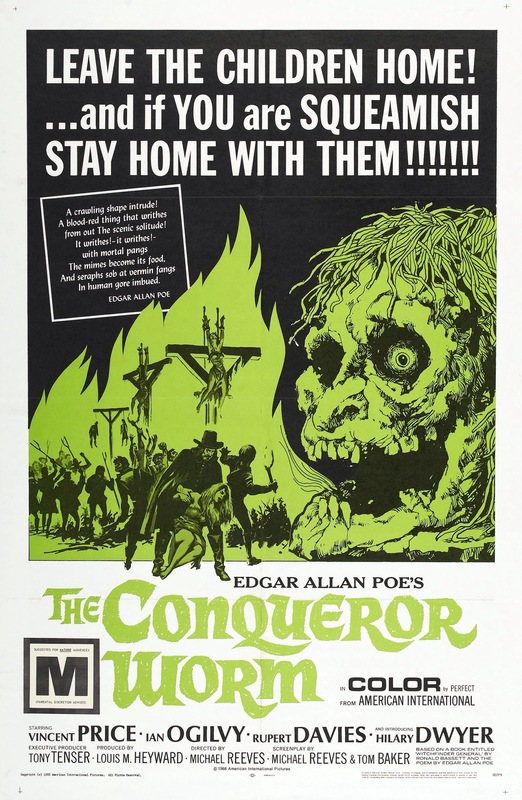 Released in 1968 Witchfinder General also goes under the title The Conqueror Worm to tie in with Edgar Alan Poe, but Witchfinder General, which is my preferred title has nothing to do with the works of Edgar Alan Poe. I assume with success AIP was having with their Edgar Alan Poe adaptions is why Poe was tied in, which is depending on the version you see. 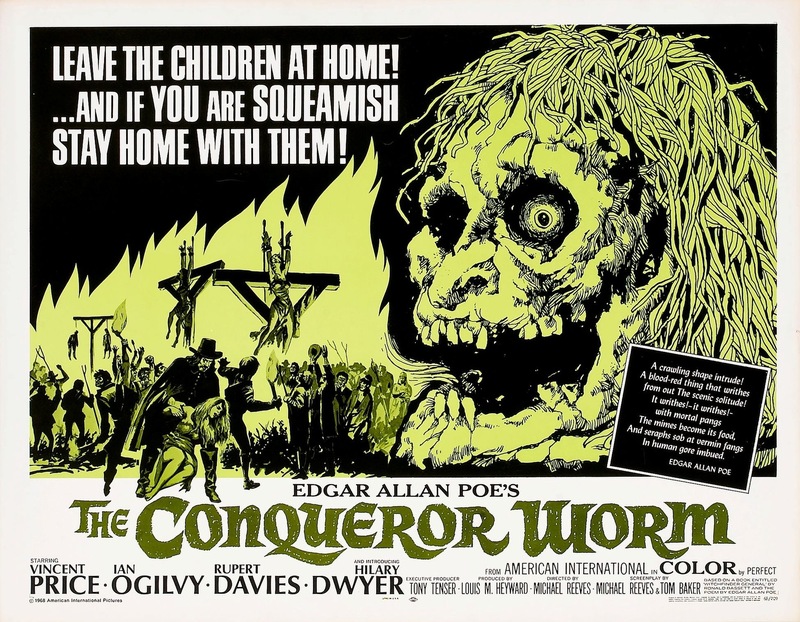 Witchfinder General has no ties to Poe whereas the Conqueror Worm does, but its only in the opening and closing. This film is based on a real person and based off a novel by Ronald Bassett, but I wouldn’t watch this film for factual events. 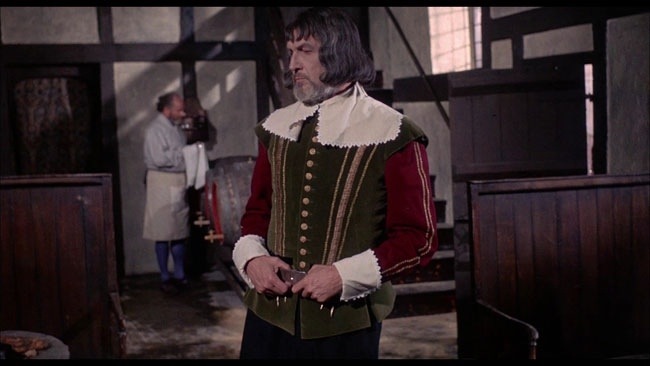 Witchfinder General is vastly different than the films Vincent Price starred in with such filmmakers as William Castle and Roger Corman who Price had his most success with. Witchfinder General kind of goes hand in hand with another Price film Abominable Dr. Phibes as they started a change in his films. By the time 1968 rolled around with the releases of such films as Rosemary’s Baby and Night of the Living Dead the horror genre was very much changing and film as a whole was greatly changing with the emergence of filmmakers such as Sergio Leone. Each decade we see changes and the 60s very much helped shape filmmaking all the way through to the modern era. And of course things would change even more in the 70s. 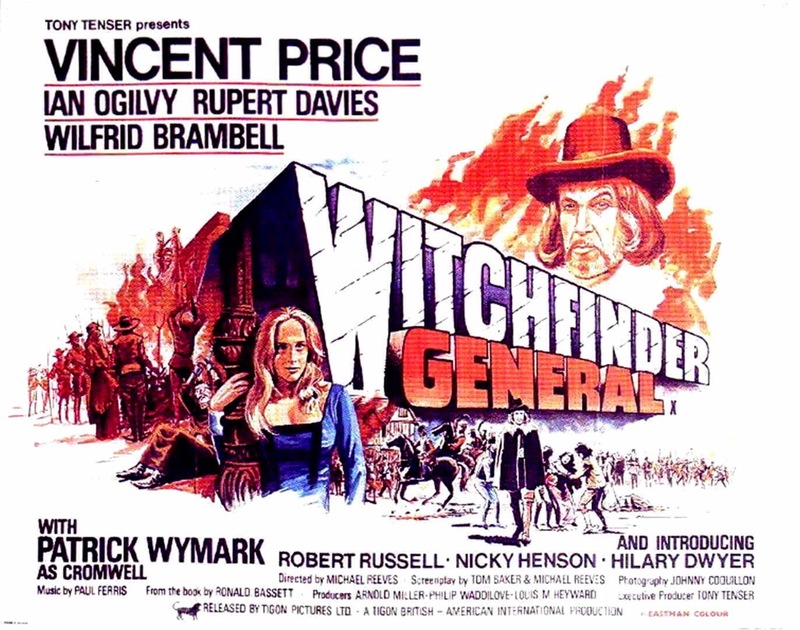 Witchfinder General is far more graphic than the films Price previously starred in and the film even borders exploitation film. 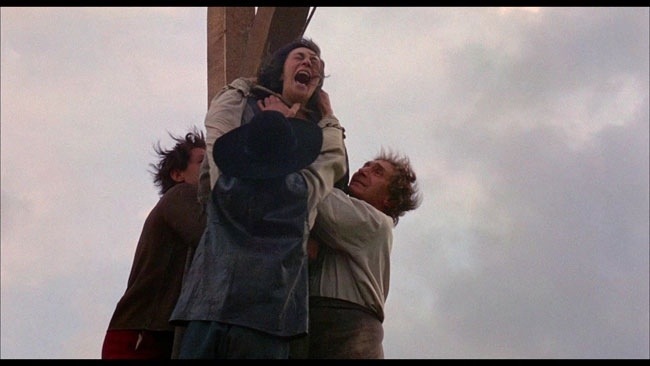 By modern standards Witchfinder General is still violent just take a look at the last scene, but at the time of its release it was far more graphic. 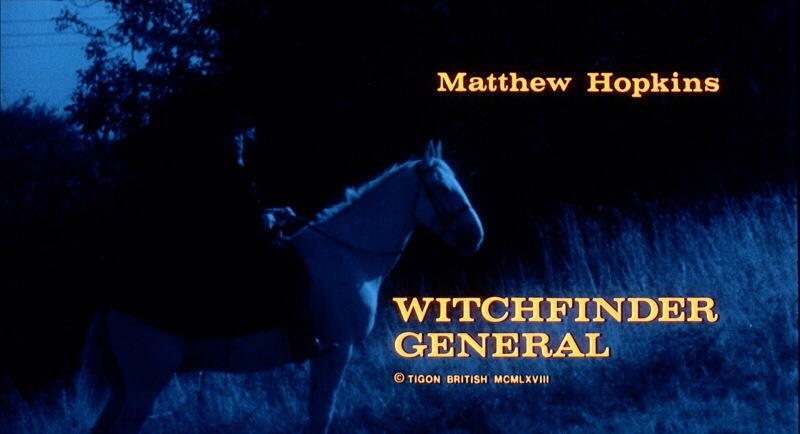 Matthew Hopkins (Price) goes around gathering people who are suspected in witchcraft. 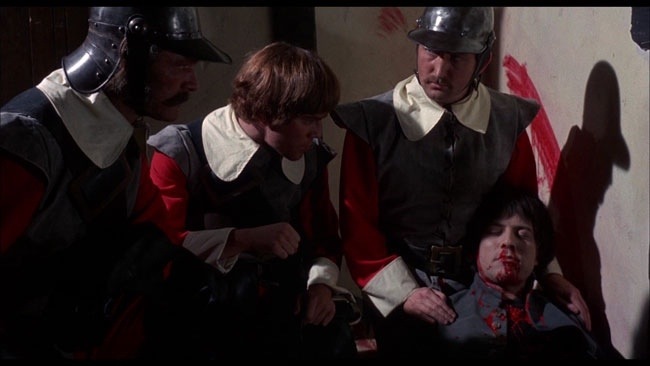 After he targets two people close to Richard Marshall (Ogilvy) he vows revenge and sets off to kill the evil Witchfinder General. The screenplay was written by Tom Baker & Michael Reeves and its simply a terrific script. Its well plotted with excellent characters that are easy to root for, sympathize with and hate. As much as I love the horror genre it isn’t always about writing or directing and acting, but there was a time when people took pride in the genre that isn’t to say there aren’t any left, but past eras there seemed to be more effort and the screenplay by Baker & Reeves shows that. Director Michael Reeves crafts in my opinion one of the very best horror pictures of the 60s and while the film has a following it deserves far more attention. 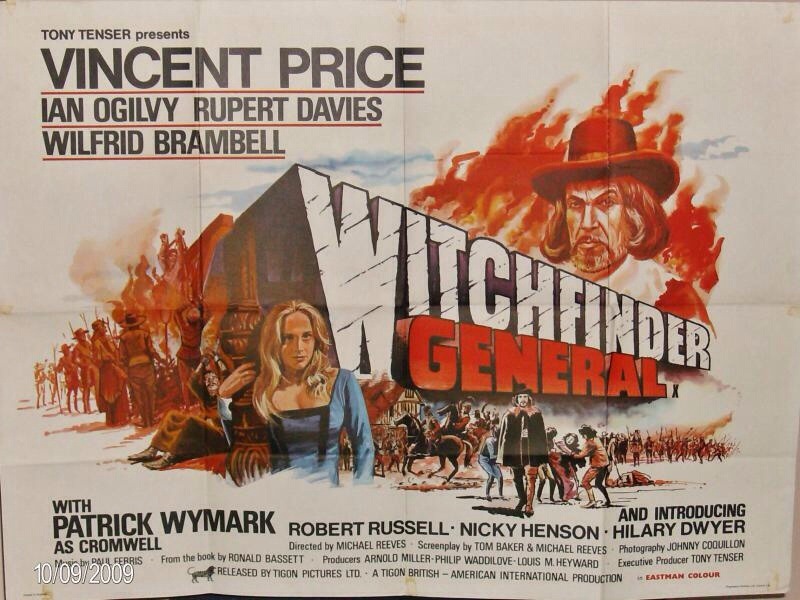 Witchfinder General is a great film. Reeves crafts a well made film with great pacing. Reeves sets up a sinister tone with strong suspense. Witchfinder General isn’t the typical horror film as there aren’t any jump scares, but what makes it scary for me is being accused of something you didn’t do. While witch hunting is a thing of the past how many times do we hear about people being convicted of a crime and spending years or even decades in prison and later finding out they were innocent? As I mentioned the film was quite graphic for its time and would still be fairly graphic in modern times. 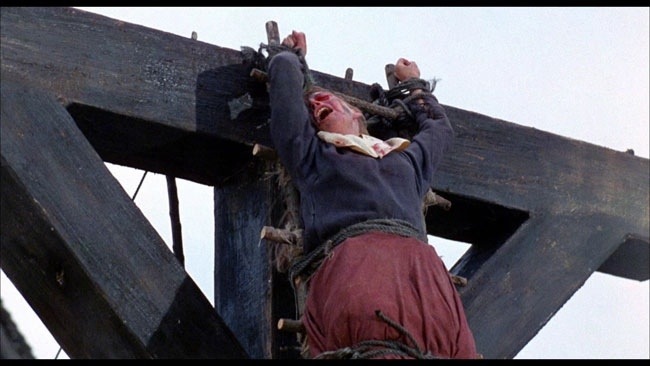 We have a woman burned at the stake, people getting tortured and of course as mentioned the final scene. 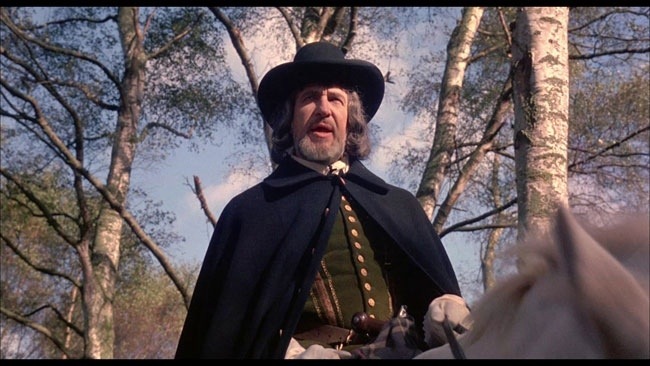 Witchfinder General was the 4th film Reeves made ended up being the last film he made as he tragically died February 11th, 1969 at the age of 25 from an accidental overdose. Had he lived I think he would have gone onto be a great filmmaker. Like I mentioned Sergio Leone and George Romero being rebel filmmakers I think Reeves would have been one as well. Michael Reeves would I think gone down as one of the genre greats. 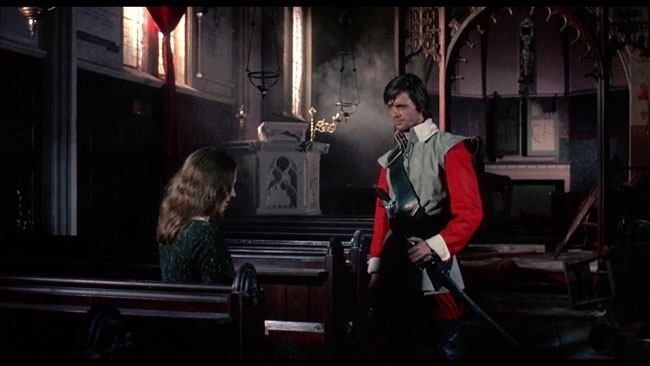 The performances were top notch with Ian Ogilvy making for a noble and great hero. Hilary Dwyer is also great and charismatic and highly sympathetic. 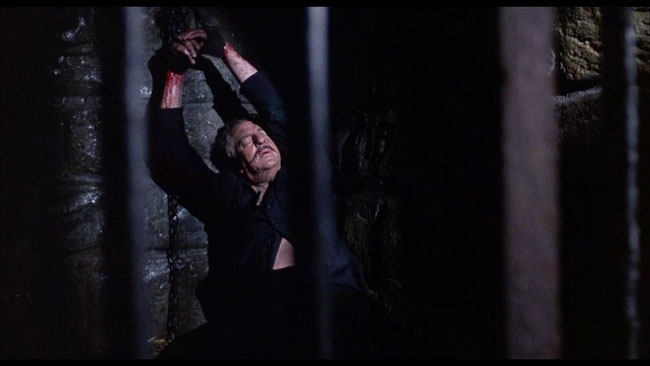 Often overlooked is Robert Russell who was brilliant as the evil John Stearne who takes great pride in the torturing people and of course there’s Vincent Price. Throughout his career Price has had many great roles as both hero and villain and he’s equally at both. However in my opinion as Matthew Hopkins he was at his very best. Price is cold and cruel and its quite easy to instantly wanna see him get what’s coming to him. As Matthew Hopkins this was quite an achievement for the legendary and iconic Vincent Price. Originally Michael Reeves wanted Donald Pleasence, but AIP who co-funded the film wanted Vincent Price, which lead to some problems on set between Price and Reeves, but as the production went on the two came to a mutual respect and put their differences behind them. In October of 2013 Scream Factory released this film as part of the Vincent Price Collection with 5 other films and the HD presentation is terrific and along with the Abominable Dr. Phibes the best transfers on the set. While not every shot looks great, colors pop and its simply just a great HD transfer with excellent audio.